Now! That’s What I Call Music volume 100 is released on July 20th. When the idea was first floated, Now! Music speculated that they might put together a compilation covering the best of every album. That doesn’t seem to be happening, but that doesn’t mean we can’t adapt that idea into something democratic that in the best traditions of a music-related TV Cream feature truly reflects the people’s actual choice of the best pop music. We’re not going to go through all 99 volumes up to this point, because that would defeat the purpose of TVC and there’s far too many people on the recent volumes we’ve never heard of, but Now! 50 from November 2001 seems like a good cut-off point. What we’re going to do therefore is – in association with our Creamguide mail-out – over the next 10 weeks, taking five Now!s at a time, putting forward a choice of the best four tracks from each volume and then put them to the vote on our Twitter account at @tvcream on Friday morning. Three of the four will be selected by our special in-house committee, one by a special guest judge every week. By the end of the feature we will then have put together a strong tracklist covering the first half, or first 18 years if you prefer, of the series and of pop music itself. There’s a second version of the advert but Tracey’s pretend free-associating and the Domesday Detectives-style long room graphics chimes more with the image they’re trying to get across. Not ‘Volume 1’, notice, but five weeks on top of the album charts meant Virgin/EMI knew they had something beyond the possibilities even Raiders Of The Pop Charts opened up from the off. 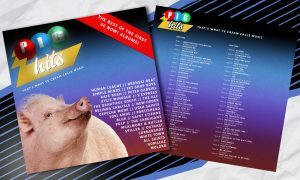 No pig mascot promotion as yet but the original image was present alongside the tracklisting. A couple of notable edits and the sleevenotes assuring us Culture Club’s Victims would be “almost certain no.1 by the time you have this LP” the only down sides. A Red single, the last produced for them by the great Martin Rushent before he fell out with Susan and walked out of his own studio. Phil Oakey’s baritone is set to stun and Jo Callis sneaks himself a few lines, but it’s the walking bassline and detuned synths that give it the quality of sounding like someone left Motown on the radiator for too long. Crossing the brow of the hill that separates Nutty Boys from Downbeat/Less Popular – Mike Barson told the rest he was leaving weeks earlier and this would be their last top five single. This actually is a Monsieur Barso song, again adapting Motown tropes for its own ends with its stomping beat and strings for sophistication. So obviously Chas Smash put out a message to his imprisoned brother on Top Of The Pops, which earned them another studio ban. “And sing!” The legend of the song, whether the declaiming friendship on the basis of “don’t dance” or the anachronistic Mummer-friendly pagan festival video (for a band from Montreal) starring both Little Ron from Maid Marian And Her Merry Men and the future editor of Cosmopolitan – is basically entirely memetic these days. But isn’t it undeniable? Joyous, memorable chorus, undeniable keyboard hook, and a great big Moog whoosh in the middle. Both cover and advert presented in a more matter-of-fact way than before, unnecessary Roman numeral and that knowing resampling of the Thompson Twins title notwithstanding. Inside sleeve reminds us to “complete your collection. NOW 1 is still available”. Not much of a collection, that. Macca’s only solo number one, surprisingly, and while presenting him in full thumbs aloft/wobbly head pose we kind of like Paul when he’s being all optimistic. Throw in the frantic tabla solo, the electronic noodling at the start that briefly returns round the middle, the synth middle eight, the passing dismissal of the Trammps and the Somme kickabout video, and you can’t go wrong. The Pyke-bothering audio perfectionist was too obtuse to ever become a consistent hitmaker and the song most remember him for didn’t even crack the top 40 here. And let’s be honest, parts of this aren’t ageing well, not least the very concept of a rap attack. Also, what kind of school was he attending where “having the funk” was an expellable offence? But what fun getting there, the weird jagged robo-funk with trombone solos and Fairlight a-go-go. Pronoun-switched Madness cover with Kinnock video cameo – the hand of Stiff Records very much evident everywhere here – seemingly overlooked in the Ullman catalogue these days but she gives it her all and the melancholic element is set to full. And suddenly the Glover-vocalled porcine is in full effect. “The pig one” indeed, Danish Agricultural Produce getting their overdue credit – the original artwork hung on the office wall of Virgin executive Simon Draper but their legal representative Stephen Navin claims the idea of using its caption. Also the debut of the legendary coloured balls design, creited to one John Aldred. Now videos given their advertising due “for all you videoholics”. David Sylvian’s Red Guitar must have tried people. The Nanas’ imperial phase was surprisingly shortlived, with the next single missing the top 20 entirely, but this was the single that showed they weren’t just bedroom choreography and three days of studio vocal drop-ins, sounding like both girl group and Nile Rodgers funk with a chorus counter-melody that makes the whole thing. Oh, and Siobhan says it’s about a woman who turns to Hollywood fantasy after being date-raped. Both incredibly lyrically important records in different ways, but very different musically. Jerry Dammers’ last stand is a township jive that’s as danceable as anything the full deal Specials made, our introduction to Jimmy Somerville’s remarkable wouldn’t-that-strain-his-throat falsetto the sympathetic sound of 1984 modernity with its burbling keyboards and Linn drums. Both records that sound absolutely of their time as well as of the years ahead. This. THIS is the pig at his height, complete with celebratedly priapic delivery of the Moroder/Oakey combination. 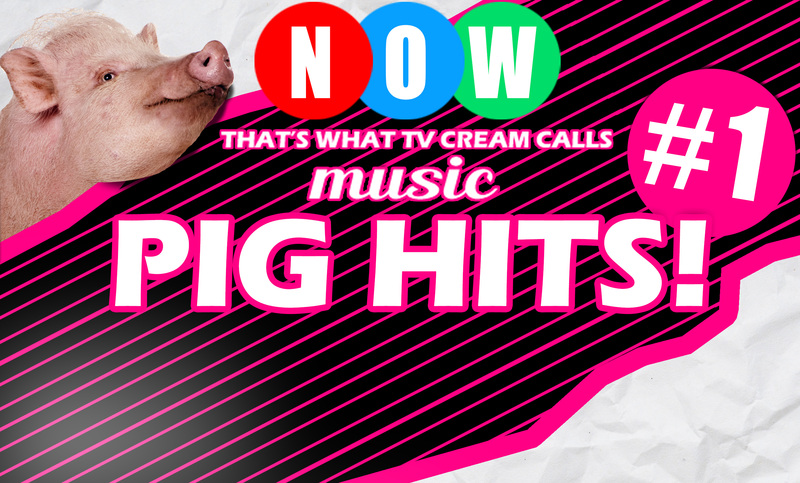 “32 chart-hoggin’ hits” claims the strapline. Whose idea was it to not only feature the Arthur Baker Special Dance Mix of No More Lonely Nights but have it at side 1 track 1? Ashley Abram’s, obviously, the celebrated compiler poached from Ronco when it turned into an ongoing series and given his first credit on this volume. Unfortunately not there any more, he quietly retired in 2012. The only Now! not to reach the top spot, supposedly this is the most difficult to get hold of in its original form. The first record on Madness’ Zarjazz label, and a hell of a lot better than Suggs and Chas Smash aka the Fink Brothers’ Mutants In Mega City One. Also Sharkey’s solo debut, a joyous stomp that appears to be going at two different speeds simultaneously and the kind of thing that he never went near doing again in his career. More of Talcy Malcy’s adventures in “I made punk/hip-hop/Afrobeat/skipping popular, now let’s see if I can make THIS popular!” It would eventually run aground when he went on about chiptune to whoever would listen, and it’s not as if the arias plus 80s R&B production project Fans produced any other hits, but with a pre-Pet Shop Boys post-Rock Steady Crew Stephen Hague producing his ability to do something with disprite elements for pop ears was on top form. It may have taken time for people to forgive Paul Weller for breaking up the Jam, possibly including Weller himself, but he produced some of his best, most cutting material having broadened into socio-political blue-eyed soul for hanging around pavement cafes in button down polo shirts or cycling gear. Mick Talbot’s piano part is none more Wigan Casino. “A posh double album” quoth the pig/Glover in what would turn out to be its/his last stand, however posh something that finds house room for Rory Bremner as the Commentators’ Hardcastle-mocking (and secretly Hardcastle-produced) N-N-Nineteen Not Out can be. If you own the CD version that not even Abram has seen a copy of, a battalion of record collectors would like a word. “Make it pig” doesn’t even work. Not only had You Spin Me Round happened since Now! 4 but so had Lover Come Back To Me, but Abram decided to take a punt on the then-new single instead. Lucky really, as this may be the best thing they did, too slow for Hi-NRG, too fast to be contemplative, with plenty going on amid the hooks and an undislodgeable chorus which allowed Pete Burns to command the Pops stage without moving a step. Another follow-up to a big debut hit by someone who’d been hanging around for years that didn’t sustain the chart momentum but was nevertheless chosen for Now! ahead of the better known song. (Snappy description.) As with Dead Or Alive, compared to that hit Duffy knows better what he wants to do with the pop form by now – lest we forget Kiss Me needed a remix – and in his case that’s be urbane and smart about it while a synth impersonates Pino Palladino’s fretless bass. And now, pop-reggae by way of Gramsci-inspired critical thought on language construction. The catch of course is that people liked it neither for the downstrokes nor the semiotics debate but for the luxuriant bubble bath of a backing to Green Gartside’s honeyed croon, making it sound like the very idea of a love song that it simultaneously critiques. Huh. At least one of the TVC office has seen this performed live, which couldn’t have been said at the time. That’s the first five done – keep an eye on Twitter tomorrow morning as we put our choices to the reader vote, and get thinking about Now!s 6-10 next week. 1983 was a watershed year for two of my favourite bands of the early eighties, Madness and The Human League, and both would never be automatically be guaranteed Top 10 hits after this date. I actually quite like the more serious, post ska era of Madness, when their melancholy tunes like Michael Caine and Yesterday’s Men might not have sold as well as Baggy Trousers, but they had a certain mature edge to theme. Human League, though, after the Motown sounds of Fasscination came a dire attempt at trying to be U2 and two total dirges about snow on the ground and someone called Louise that missed the Top 10 big time. ( Human was OK from 1986 and pleased the American market again).